Editor's Note: NASA has revised their size and energy estimates for the Russia meteor upon review of further data. Scientists now believe the small asteroid was about 17 meters, or 55 feet, in diameter and had a mass of 10,000 tons. The revised estimate of energy unleashed by the meteor is about 500 kilotons, more than 30 times the blast yield of the atomic bomb dropped on Hiroshima. A meteoric blast over Russia on Friday was the biggest in more than 100 years, according to scientists, releasing 500 kilotons of energy, shattering windows, and injuring more than 1,000 people. The injuries were mostly cuts and bruises from broken glass, according to Russian state news reports. The meteor appeared at 9:20 a.m. local time (0320 GMT; 10:20 p.m. EST) near Chelyabinsk in Russia's Ural Mountains. NASA scientists told reporters Friday a 55-foot-wide asteroid streaked over Russia at 40,000 mph, briefly glowing as bright as the sun as it broke apart from intense heat and pressure and plowed deeper into the atmosphere. "This is the largest recorded event since the Tunguska explosion in 1908," said Paul Chodas, research scientist in the Near-Earth Object program office at NASA's Jet Propulsion Laboratory in Pasadena, Calif.
Until Friday, Tunguska was the modern event most often referenced by scientists to illustrate the destructive effects of a meteor. An exploding comet or asteroid in June 1908 leveled 800 square miles of desolate forest near the Podkamennaya Tunguska River in Siberia. The intensity and damage from Friday's meteor was much lighter, but scientists believe it outranks any known meteor since Tunguska. Chodas called the Russian meteor a "tiny asteroid" and said it approached in a north-to-south direction, meaning there is no chance the object was related to the flyby of asteroid 2012 DA14, which harmlessly flew more than 17,000 miles from Earth later Friday. The meteor over Russia left a twisting trail of vapor hundreds of miles long. 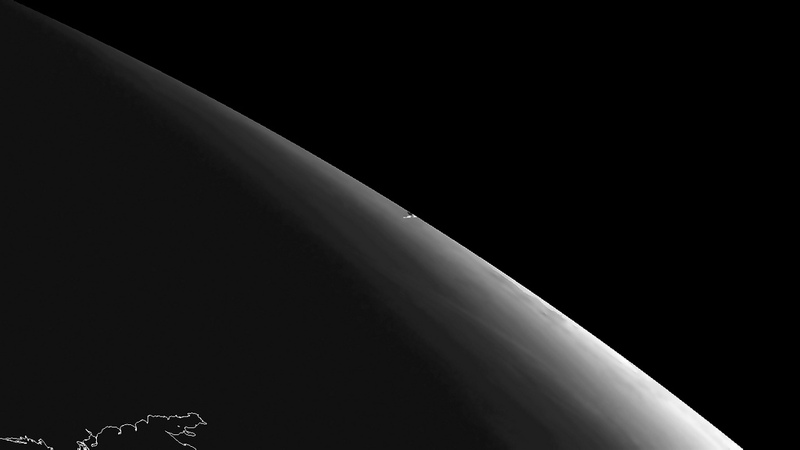 A European weather satellite 22,300 miles above Earth spotted the contrail with an imaging camera. Bill Cooke, head of the meteoroid environments office at NASA's Marshall Space Flight Center in Alabama, said the asteroid entered the atmosphere at an angle of about 20 degrees and disintegrated between 12 and 15 miles above Earth, sending a shock wave to the surface powerful enough to bust windows and set off car alarms. The energy released by the meteor was equivalent to about 500,000 tons of TNT, more than 30 times more powerful than the atomic bomb dropped on Hiroshima, Cooke said. Scientists estimated the meteor's energy from observations by infrasound stations designed to monitor compliance with the Comprehensive Nuclear-Test Ban Treaty. Officials with the Russian Emergencies Ministry told the state-run RIA Novosti news agency about 50 people were hospitalized with injuries, and up to 1,200 people sought medical treatment. Astronomers say some fragments of the object could have reached the surface, and Russian news outlets report unconfirmed findings of meteorites in the region. Amateur videos posted to YouTube showed the object plummeting through the atmosphere, followed moments later by the thunderous sound of sonic booms or explosions. Europe's Meteosat 10 weather satellite spotted the vapor trail left behind the meteor over Russia. Credit: Eumetsat. See a larger image. Asteroid 2012 DA14 is much larger than the meteor over Russia. It measures about 150 feet wide and would have struck Earth with energy equivalent to 2.4 million tons of TNT. Friday's flyby was a near-miss in cosmic terms, and it was the closest buzz by an asteroid of its size in recorded history. Experts say similar-sized asteroids are predicted to reach that distance from Earth every 40 years. An impact with Earth from an asteroid the size of 2012 DA14 is expected about every 1,200 years. Asteroid 2012 DA14 flew by Earth on a south-to-north course, and its closest point to Earth occurred over Indonesia at 1925 GMT (2:25 p.m. EST). Astronomers in Spain discovered asteroid 2012 DA14 in February 2012, and its flyby of Earth was known nearly a year ago. But the spectacular meteor fall over Russia came with no warning. According to Cooke, an analysis of the meteor's trajectory shows it approached from the day side of Earth. "It was in the daylight sky, and telescopes can't see objects in the daytime," Cooke said Friday in a conference call with reporters. The coincidental cosmic encounters could raise awareness about the potential of asteroid and comet impacts on Earth. Scientists are sure they have found the majority of the largest asteroids, which could wipe out civilization on Earth, but experts believe the space catalog covers just 1 percent of the objects the size of asteroid 2012 DA14. Rep. Lamar Smith, R-Texas, said the House Science Committee will hold a hearing in the coming weeks to examine ways to better identify and address asteroids that pose a potential threat to Earth. NASA's annual budget for asteroid detection and monitoring is about $20 million, according to Dwayne Brown, an agency spokesperson. Some of the funding is distributed to telescope teams around the world who scan the sky for asteroids. Public-private partnerships could foster opportunities to find threatening asteroids. The B612 Foundation, a non-profit organization founded to help protect Earth from asteroids, plans a privately-financed space telescope for launch in 2018. The Sentinel Space Telescope will discover and catalog 90 percent of near-Earth asteroids larger than 350 feet, and about half of near-Earth asteroids larger than 100 feet. Ed Lu, chairman and CEO of the B612 Foundation, said Friday's asteroid encounters are a "wake-up call that the Earth orbits the sun in a shooting gallery of asteroids, and that these asteroids sometimes hit the Earth." NASA has a Space Act Agreement with the B612 Foundation to share data, but the space agency has not agreed to provide any funding to the project.